There are so many fashion trends all over the place. The Trending Now hashtag is being blasted left, right and center with all the latest and most popular trends. But do you know what’s trending the most, your Individuality. We can find ourselves so caught up in the latest trends that we lose ourselves, who morals, our values and our style. The most important thing you can own in this booming fashion industry is your own personal style. Your style is you and you are you style. They say that fashion is the outward expression of your inward self. You wear things to reflect your beliefs and to show how you feel. When you are dressing a certain way that you don’t particularly like, just because everyone else is, you have become overwhelmed with the latest trends and your have abandoned your style. I’d say fashion is dependent on the individuals ability to pull of the latest trends in keeping with their own personality. The trend that had slightly alarmed me, putting it nicely, was the beanie aka woolly hat. Its the middle of July, the sun is beaming down on this earth with its strongest rays since 1961 and these girls are wearing beanies, as though to keep their head warm? I think it stood out most to me when I saw a girl lifting her beanie, in July, to wipe away the sweat from underneath. With beanies selling from anything between £5 and £610 people were going crazy for this fashion trend. Imho it was a trend seasons too early. If we follow these kind of trends continuously the hashtag #TrendingNext will be full of people wearing vests in the Winter, Watches that can’t tell the time and onezies on the beach. This morning I woke up, took a look at my swag rack and decided to go to my overflowing ‘chesta draws’ for some inspiration instead. I took out this skirt because I wanted to be free from jeans or trousers for a day or two, and then I wondered what I could wear it with. I always wear a solid colour top whenever I have put this on before, but today I was opting for a change. Most people wouldn’t think to pop two similarish prints together, so I thought I’d have a go and see. And I LOVE it! Mixing and Matching Prints is #sohotrightnow. This is been known as ‘#Prixing’ of late and again it is so hot and so trending! From the catwalk to the side-walk you will find someone somewhere Prixing. Take a print or two and put them together to make a LOUD statement. For those of you who aren’t as comfortable in such a LOUD attire, why not pop a blazer or a cardigan over the top. This way you can still be a prixer but subtly. Do you ever feel like you stand in front of you wardrobe every morning for about (half) an hour, repeating to yourself ‘I have no clothes… I have nothing to wear‘? Or decide maybe when you get out of the shower you will have thought of something, and then you still have no idea? Well me too! It is the most annoying thing, and everyone believes I have so many, too many, clothes but I just don’t see it. Until very recently this was a problematic daily for me. I would have to wake up that extra half an hour to an hour early just to sort out my clothes for the day. (This is what made me miss school uniforms, although I always argued against them while at school). 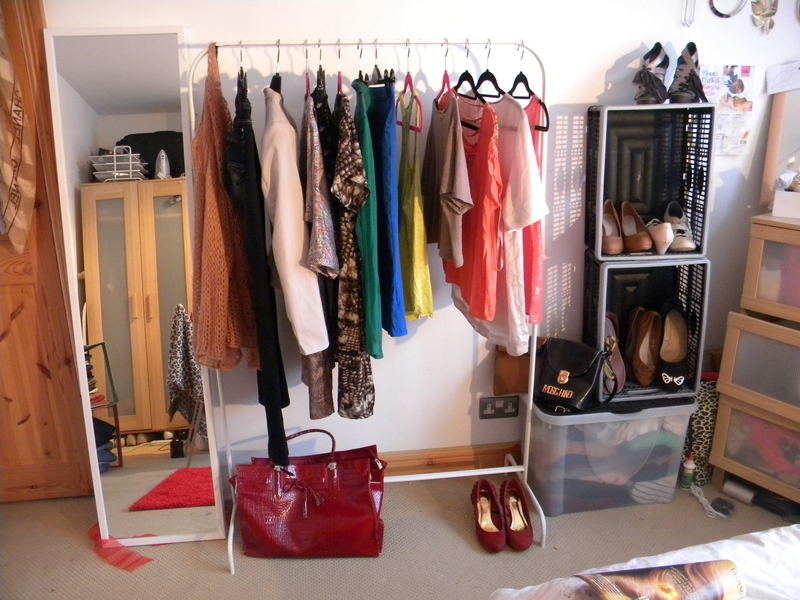 A few days back I brought a clothes rack from Ikea, it was the cheapest on going at £6.50. I don’t intend for it to last very long but I thought it wont hurt to try out the concept of ‘The Swag Rack’ I had heard a bit about. And I must tell you, it has brought nothing but ease. My clothes are never creased any more so it saves me time on ironing out the fold-lines and creases. Also, if I know what I am doing in advance I can just put a weeks worth of clothing out for the specific events that are to occur. You see what I mean, your personal fashion week is planned and prepared. There’s no more waking up in the morning crying to yourself because you can’t find anything to wear in the piles of clothes in your chest-of-drawers and wardrobe. All you have to do is get on that cat walk you strut you beautiful self throughout the days. Stress free! 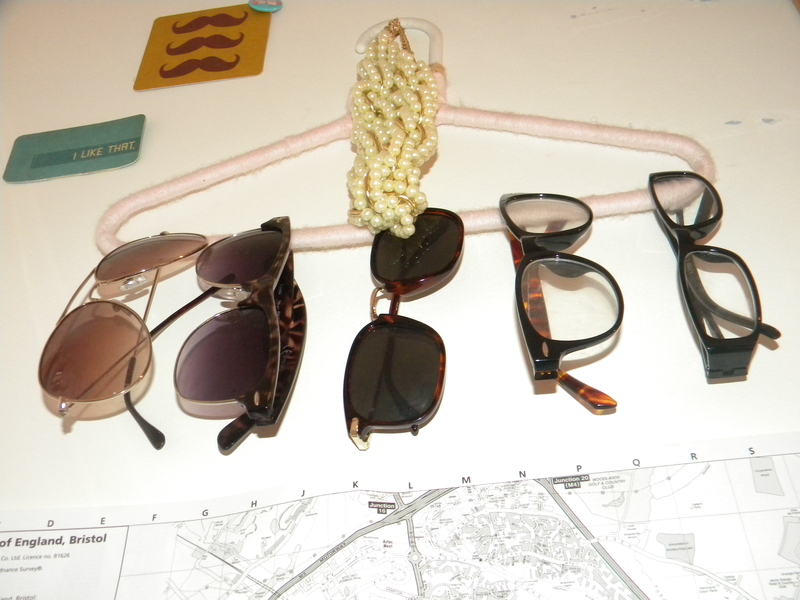 And if you want even more ease, why not make a jewellery rack and a sun/glasses rack. 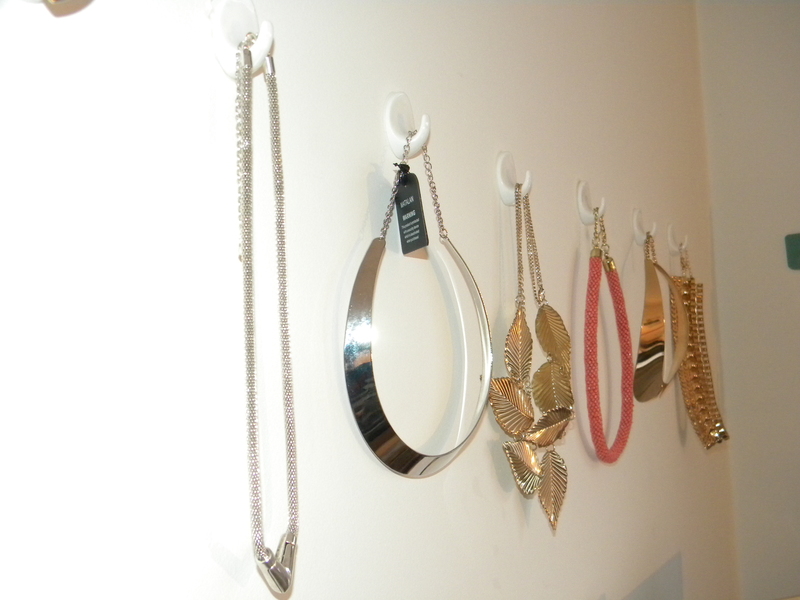 > These not only bring ease and organisation, they add a stylish look to your closet or bedroom. The back to school college, university necessities. Being a student is naturally stressful, especially if you move away from home. There are contracts you must honour, bills you must pay and books you must read. Financial planning is a new untutored lesson you must endure and friendships need to be formed and rekindled. 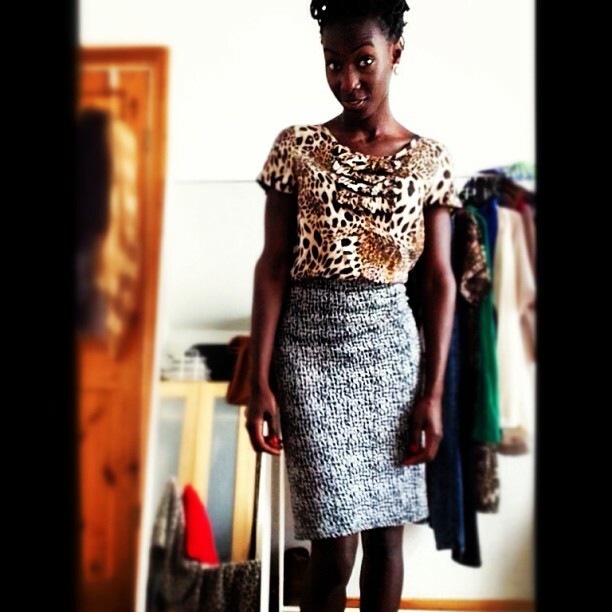 However, it does not all have to be hard work, your new term wardrobe can be stylish, affordable and easy. Bicycles and backpacks are, and have been, the most conventional pieces in ‘the student lifestyle’ since before I can even remember. This is because they bring about ease and comfort. If you live near by your university or college you needn’t worry too much about a bicycle, but for those who are slightly farther away, a bicycle will save you money on transport and even a gym membership (exercise is a necessisity while studying). A backpack is a necessity for students, they are spacious, at least some are, and they cater for all needs. And most importantly they give equal balance between shoulders, thus supporting the back. Now bicycles and backpacks can play a huge part in you term time wardrobe. Not only are the beneficial in that they can save you money or support you health-wise, they are being made more and more stylish to fit any fashion/style genre. This ensemble brings perfect ease for either gender, with a foldable bicycle you can go almost anywhere (anywhere except swimming!) and with a comfy spacious, yet strikingly stylish backpack journeys to and from your home town, to class or to work are made beautifully easy. 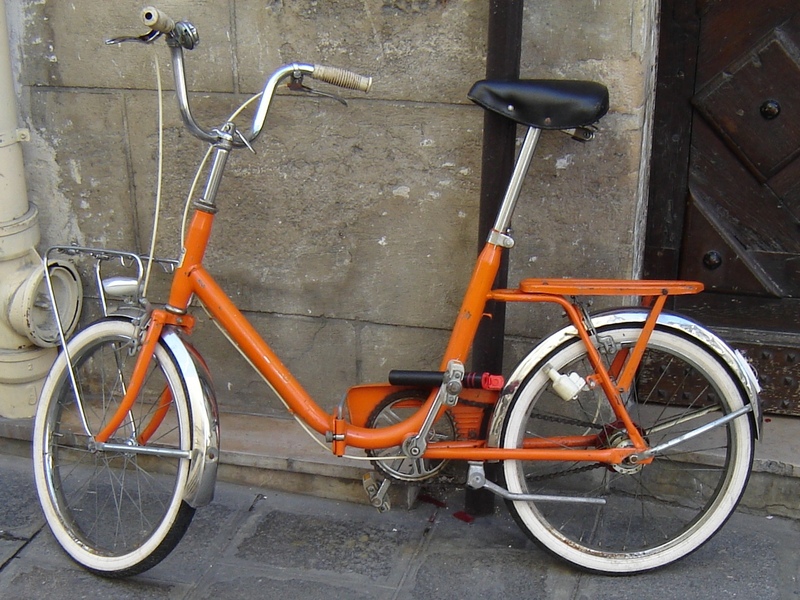 I am sure some of you may not be too into the tangerine colour, so you would be pleased to know the foldable bikes are not limited to this colour. 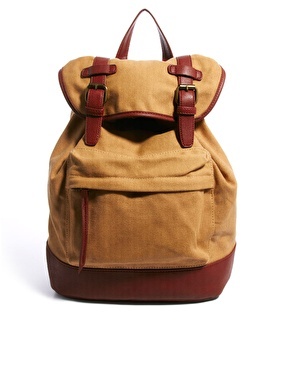 Check out Asos.com for this bag! The mountain bike is excellent for anyone who might have to travel through a park or places with uneven grounding. This sturdy bike (not specifically this one) can be spiked up with a studded bag. This bag is very unique, The zip through the front has a pleasing look, however, it may not be you safest option; so bare that in mind.. studs are still cool tho’. DIY TIP: why not try a apply studs to your bicycle frame to give it a new edgy unique look. I have come across any studded bicycles as of yet. Be the first! Or why not try to mix and match various style bags with various styles of bags. Remember if you love it, you could pull it off!